Fundraiser by Khudai Tanveer : #FreeChin from Detention! 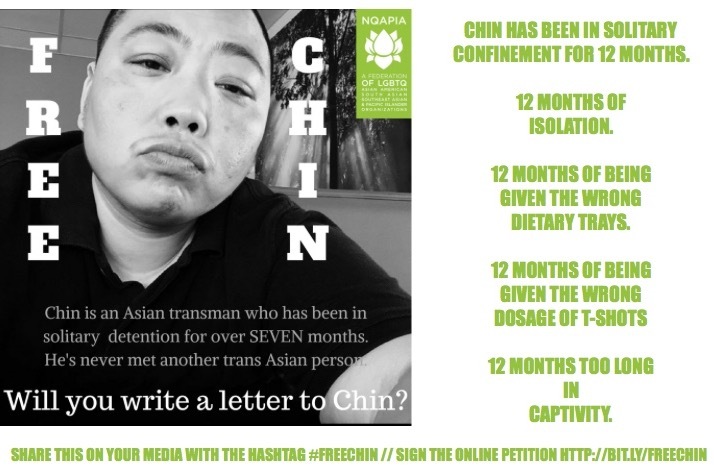 Chin is a trans man from Hong Kong that has been in SOLITARY custody of ICE Detention Facility in Irwin Georgia for the last TWELVE months facing deportation proceedings. We are crowdfunding $3650 to represent he has been in detention for more than 365 days. This money will go to supporting his campaign and well being. Chin is being kept in solitary because the facility wants to, "keep him safe", so they say. However, in those 12 months he has had a multitude of medical issues due to being given the wrong food, he is a diabetic. Has been given incorrect & delayed testosterone which impacts not only his physical health but also his mental health. But yet they claim to be keeping him "safe". His will only be SAFE when he is RELEASED and with his community. We DEMAND that Chin be released to us. To support the organizing around Chin we are collecting funds for commisary food, transportation, and for a variety of needs we have evaluated to be important in this struggle to get him out. The National Queer Asian Pacific Islander Alliance (NQAPIA) is a federation of lesbian, gay, bisexual, and transgender (LGBT) Asian American, South Asian, Southeast Asian, and Pacific Islander (AAPI) organizations. We seek to build the organizational capacity of local LGBT AAPI groups, develop leadership, promote visibility, educate our community, enhance grassroots organizing, expand collaborations, and challenge anti-LGBTQ bias and racism.